Have you every attempt a file move only to have your mouse skills falter the process and now you must search to find where the file end up? Or just delete the wrong file or folder? I’m good at select multiple files and accidently create copies. In any of these cases using Ctrl + Z or Edit \ Undo will quickly reverse whatever you didn’t mean to do. In the example, below I selected recipes to move. I accidentally copied the recipes instead. Select Yes to verify that I want to delete the copies made. Now I’m back to where I started. Crawling around under a desk to retrieve a fallen cable is never a fun task. There are hundreds if not thousands of product specially design to solve this problem. Some work (I’ve bought those) and some don’t work (I’ve bought those also). It wasn't until reading an article from one of my favorite websites (lifehacker.com) that I solved my cable problem with binder clips. Clamp the binder clips on the edge of your desk, monitor stand, or book shelf. Remove the handles, slide the cables into the handle, and then reattached the handles. Problem solved! Above is a picture of my desk. The binder clip holds my network and power cable for my laptop. Inside the brain of a Geek: New to Office 2013? Start here. 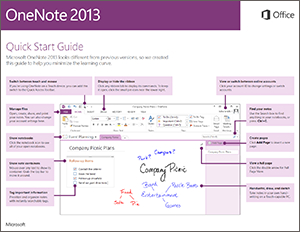 You can download free Quick Start Guides to all Office 2013 applications. Each guide contains useful tips and shortcuts. Microsoft offers guides for the following applications. It is summer; time for afternoons at the pool, weekends at the lake, and playing in the sprinkler. These fun summer activities increase the likelihood that your phone will come in contact with water. When your phone gets wet, act quickly and follow the steps below to increase the chance for survival. Limit the phone’s movement to avoid moving the water through it. Remove the battery. Not all phones have removable batteries. Remove SIM card and all accessories to include ear buds, memory cards, and cases. Gently remove any visible liquid from the outside of the phone. If you have access to a vacuum, use it to pull the moisture out. Don’t use a hair dryer because it will push the liquid further into the phone. Put the phone in a bag of rice for a minimum of 24 hours. Increase the time to 48-72 hours for phones that were submerged. Be patient! Turning on the phone before it is completely dry may cause it to short circuit. Inside the brain of a Geek: Three reasons why you may be causing those email errors. Pam, why isn’t my email sending? There are a lot of reasons an email might get stuck in the Outbox or cause a bounce back message. If you email server is working, check these three common issues and see if you are the reason the email may not be delivered. 1. Attachments. The biggest reason size. Most email hosts can only handle emails between 10 - 15 MB. Please note that is total email size, not the size of each attachment. My rule of thumb anything over 10 MB and I use a file sharing service. 2. Financial Information. You should never send credit card, account numbers, or social security numbers via email. Some systems can detect and block the sending or receiving of emails with this information. The system looks for 000-00-0000 or 1234567890123214 (16 # string) and blocks the email. . You should not send it, and they don’t want it. 3. Mailbox Size Restrictions. Large data stores will slow down a system and that is why most companies put restrictions on mailbox sizes. If users go over those restrictions, they stop receiving emails and the sender gets a kickback message. The users get a few “Mailbox Size Warning” emails prior to email receiving stopping. If you got one of those warnings, stop what you are doing and archive some emails. In the past I used about 80 sub-folders to keep my Inbox organized. The advancement of the Search features in Outlook makes finding emails so easy and accurate that I no longer worry about putting emails in the right sub-folder. But there is a lot more to searching in Outlook than the Search field. Today I’m going to highlight just a few of the more advanced options available. It is extremely common for me to have 10-20 browser tabs open when I research. My dilemma is when I have to stop and pick up where I left off at a later time. It is time consuming to save each website individually and then try to find them all later. Luckily both Firefox and Chrome have an easy way to save all open tabs into a single folder. The command is Ctrl+Shift+D. The process is the same for both browsers. My example below is for Chrome. Shortcut: Ctrl+Shift+D or Right click on a tab and select “Bookmark all tabs”. Name the folder “Newsletter Ideas” (or whatever you like) and then select “Save”. To open all the tabs go to Bookmarks. Right click the folder “Newsletter Ideas” and select “Open all bookmarks”. Now you are back to where you left off. Thanks Lifehacker for the great article! In our fast paced world, we love our conveniences and our technology. These loves are leaving us wide open for hackers. Below is a list of things you may be doing that Hackers want you to keep doing. 1. You use the same password for all your accounts. I know it is hard to remember dozens of different passwords and that is why I use KeePass for password management. Get KeePass and secure your passwords. 2. You access secure websites on free Wi-Fi. You can find free Wi-Fi almost anywhere; library, coffee shops, hotels, bars, doctors’ office, car dealership. Free Wi-Fi is convenient but not secure. 3. You answer security questions honestly. My very first pet was a kitten named Radar O’Reilly, and that is the truth. Why is it safe to put this information out for everyone to see? Every time that security questions is asked, I lie. Do not trade security for convenience. Inside the brain of a Geek: Eight signs an email may not be legit. 1. From is blank or senders email address is not recognized. 2. RE: in the subject line. You know the emails you sent so when you receive one with the subject “RE: Refund Please” look in your sent items and verify if you sent it and to whom. 3. Receiving emails not pertaining to your position. You receive an email from a sender you don’t know marked invoice, and you work in the shipping department. 4. Email is vague. Body of the email is “Amazing Video” and a link. Even if it comes from someone you know, it is more than likely a link to a virus. 5. Email has urgent or threatening tone. Email asks for confidential information. 8. Your gut says so. We all have had that uneasy feeling or voice in your head that say "something doesn't look right". Listen to it. The camera on your smartphone is for more than taking cute pictures of your dog to post on Facebook. See example below. Here are a few creative usages for the camera on your phone. 1. Mirror. Check your makeup or look underneath something. 2. Computer Screens. The print screen feature is great when it is available. Use your smartphone to take a picture of blue screens of death, boot errors or monitor issues. 3. Location of your car. Last time we parked at the Indianapolis airport, I took a picture of the nearest parking sign and the shelter we used to catch the shuttle. 4. I want that! Have you ever seen a kitchen gadget, book, or product that you have to check out? If you are like me, you will forget the name before you have time to Google it. Take a picture. 5. The special for today is? One of my favorite restaurants has a daily special board that sits on the front sidewalk. If anything interests me, I take a picture, no need to ask the waitress. 6. Shipping labels: A lot of returns are done via prepaid/printed shipping labels. You always want to keep a record of the tracking number so instead of copying it, take a picture. 7. Disassemble, yes. Reassemble, maybe. Take pictures of computers and home theater setup before moving. Do this and you don’t have to remember which cable when to the Xbox, Wii, Apple TV, or Roku. 8. Model and serial numbers: Take pictures of the model and serial number on appliances before installing. If you need to contact someone for a repair or warranty issue, there is no need to pull the appliance out to find the information you need. Bonus most pictures are time and date stamped, so you don’t have to guess the install date.